Each colourway is named after different weather phenomena. Darker shades have names that include Thunderbolt, Stormy Weather and Mistral Gale, while lighter tones have titles like Dawn Chorus, April Shower and Sunset Sky. 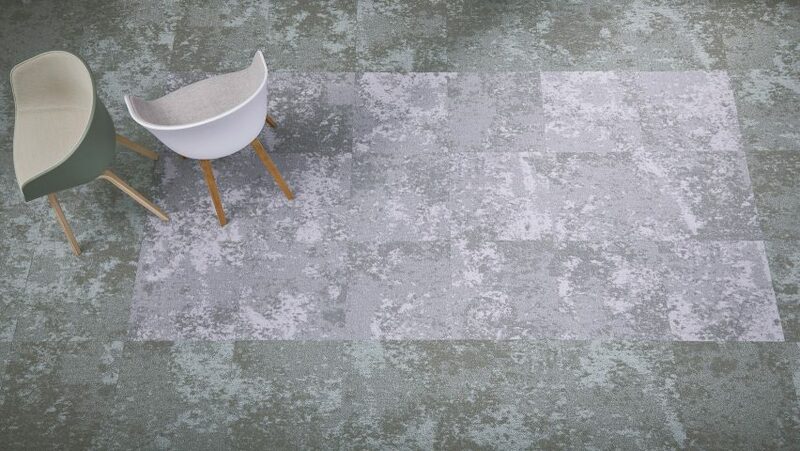 "With everyday life becoming increasingly busy, we often risk losing touch with nature – and our only connection is to the sky above us," said Janet Lowe, head of marketing for UK and Ireland for Forbo Flooring Systems. "When you look up to the sky it can be quite hypnotic, making you forget about your worries and be in the present moment. With this in mind, we designed Tessera Cloudscape with a view to bringing a sense of nature and calm into workspaces." The flooring system is made up of plush carpeted squares that utilise a multi-height loop system, to provide maximum comfort underfoot as well as an attractive coloured pattern. The Tessera Cloudscape carpet tiles can be partnered with any of Forbo's existing flooring, including the Tessera Layout and Allura Flex Luxury Vinyl Tiles. This allows the company's clients to easily create an integrated flooring scheme that fits any of their office requirements across different functional zones. Forbo has 15 manufacturing sites worldwide and a UK showroom in Clerkenwell. To find out more about the Flotex collection, visit the Forbo website.